(67%) 2 of 3 customer would recommend this product to a friend. You should consider the Microban version of this filter! Water and an ample food source provide the ideal condition for bacteria to quickly multiply and grow. In fact, on an unprotected surface, some microbes can double in number every 20 minutes. And only when they’ve multiplied to hundreds of thousands, can they actually be seen by the naked eye. 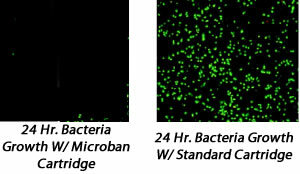 The images below show bacteria growth on a standard pool filter cartridge versus a pool filter cartrdge infused with Microban® antimicrobial protection over a 24 hour period. After viewing these images, you can see how Microban® protection begins to work immediately, disrupting key bacterial cell functions so that bacteria are unable to grow or reproduce on the surface. While on the unprotected surface, bacteria quickly multiply. This is a great filter cartridge. I'm so glad I found INYOPOOLS!!!! Thank You! This filter is easy to clean and more importantly, works great. doesnt take away any pressure from the jets and gets even the smallest of particles out!!! Filter works very well and is easy to clean.